Ralph F.M., K. A. Prather, D. Cayan, J.R. Spackman, P. DeMott, M. Dettinger, C. Fairall, R. Leung, D. Rosenfeld, S. Rutledge, D. Waliser, A. B. 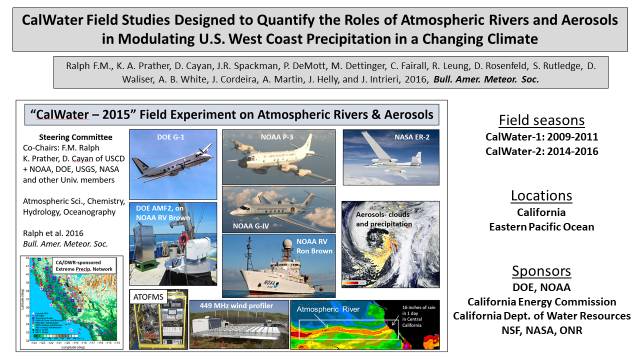 White, J. Cordeira, A. Martin, J. Helly, and J. Intrieri, 2016: CalWater Field Studies Designed to Quantify the Roles of Atmospheric Rivers and Aerosols in Modulating U.S. West Coast Precipitation in a Changing Climate. Bull. Amer. Meteor. Soc. 97, yyy-zzz. doi: 10.1175/BAMS-D-14-00043.1. This paper summarizes the 8-year-long CalWater program of field studies, from planning to field operations and analysis efforts. It also summarizes the major motivations for the program as well as science gaps addressed, and serves as the standard reference for future CalWater analysis papers. Quantifying the roles of atmospheric rivers and aerosols in modulating U.S. West Coast precipitation, water supply, flood risks and drought in a changing climate. The variability of precipitation and water supply along the U.S. West Coast creates major challenges to the region’s economy and environment, as evidenced by the recent California drought. This variability is strongly influenced by atmospheric rivers (AR), which deliver much of the precipitation along the U.S. West Coast and can cause flooding, and by aerosols (from local sources and transported from remote continents and oceans) that modulate clouds and precipitation. A better understanding of these processes is needed to reduce uncertainties in weather predictions and climate projections of droughts and floods, both now and under changing climate conditions. To address these gaps a group of meteorologists, hydrologists, climate scientists, atmospheric chemists, and oceanographers have created an interdisciplinary research effort, with support from multiple agencies. From 2009-2011 a series of field campaigns (CalWater 1) collected atmospheric chemistry, cloud microphysics and meteorological measurements in California and associated modeling and diagnostic studies were carried out. Based on remaining gaps, a vision was developed to extend these studies offshore over the Eastern North Pacific and to enhance land-based measurements from 2014-2018 (CalWater 2). The data set and selected results from CalWater 1 are summarized here. The goals of CalWater-2, and measurements to date, are then described. CalWater is producing new findings and exploring new technologies to evaluate and improve global climate models and their regional performance and to develop tools supporting water and hydropower management. These advances also have potential to enhance hazard mitigation by improving near-term weather prediction and subseasonal and seasonal outlooks.